Ideal base for exploring area. Birdsong Cottage is approximately 5 miles north of Alnwick with good links to Newcastle, Berwick and Edinburgh. Alnwick Castle, Bamburgh Castle, Craster, the Cheviots & coast are all within easy reach making Birdsong an ideal base. 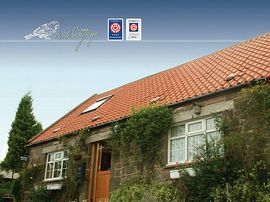 In a quiet beauty spot conveniently just off the A1 we can quarntee you a warm welcome & a very comfortable stay. Your double room has a very comfy king size bed, flat screen TV, hot and cold drink making facilities, a selection of snacks and fresh fruit, regional books of interest and a DVD library. You have a private bathroom with a good sized spa bath with a selection of candles and bath-salts, nice thick comfy gowns and slippers for you to relax and unwind in after a day of exploration. For Breakfast you can chose from a selection of hot and cold beverages, homemade, locally sourced and organic (where possible) fare. We look forward to spoiling you. Bed & Breakfast is £55.00 Per night for Double occupancy. Special Diets Provision: Special diets are catered for. All diets are catered for. From A1 Take the Brownieside turning & follow signs for Birdsong B&B.